For Women’s History Month, we’re celebrating exchange alumna Abisoye Ajayi-Akinfolarin of Nigeria, a CNN Hero, social impact entrepreneur, and founder of the Pearls Africa Foundation. Through Pearls Africa, a non-governmental organization, and her GirlsCoding centers, Abisoye is inspiring girls to believe that the sky is the limit! Abisoye credits her International Visitors Leadership Program (IVLP) exchange experience in 2017 for paving the way. During the exchange program in the United States, Abisoye visited different centers for girls and women in Seattle. There, she learned how to develop leadership and critical thinking, and how to encourage self-expression and confidence building. A visit to the Seattle Girls’ School was fundamental to her program branding, as it inspired her to create GirlsCoding. During her IVLP exchange, Abisoye says she realized the importance of having a permanent center within Pearls Africa for teaching girls how to code and develop apps. With the help of contacts made during her IVLP exchange program, she opened the first GirlsCoding center a few months after returning to Nigeria. 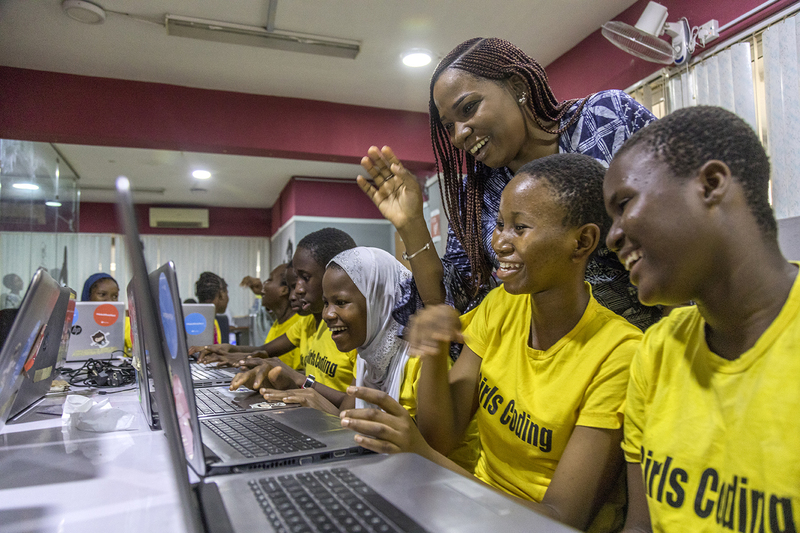 To date, GirlsCoding has helped more than 400 girls from marginalized communities in Nigeria learn how develop apps and design websites, and access mentoring and internship opportunities. In addition to her work with Pearls Africa, Abisoye participates in educational outreach programs that reach underserved populations. She also is an active member of the IVLP Alumni Association in Nigeria and she plays a fundamental role in the broader U.S. Government Exchange Alumni Association in Nigeria, an umbrella network for Nigerian professionals from several U.S. Department of State exchange programs. Abisoye, who has over 14 years of experience in Information Technology Solutions Development, has been recognized by many organizations for her work. She is the first Nigerian to be chosen as a CNN Hero. The British Broadcasting Corporation (BBC) named her one of the world’s top 100 inspiring and influential women. She was also made the #YNaijiaPowerList2018, as one of 10 most powerful names in advocacy.. In addition, she has received, the Her Network Woman of the Year Award in TechnologyH (2017), the ELOY Awards Social Entrepreneur of the Year (2017) and ONE’s 2018 Women of the Year awards. Congratulations to exchange alumna Abisoye Ajayi-Akinfolarin on all of her well-deserved awards and recognition! We are honored that she is a part of the #ExchangeAlumni family.